a form of physical or nonallergic urticaria initiated by heat (for example, hot baths, physical exercise, pyrexia, exposure to sun or to a warm room) or by excitement; the rather distinctive lesions consist of pruritic areas 1-2 mm in diameter surrounded by bright red macules. an abnormal and usually temporary vascular reaction of the skin, often associated with sweating, in susceptible individuals subjected to stress, strong exertion, or hot weather. The condition is characterized by small, pale, itchy papules surrounded by reddish areas. It is caused by the action of acetylcholine on mast cells. 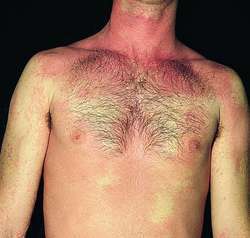 Compare urticaria. A form of physical or nonallergic urticaria initiated by heat (e.g., hot baths, physical exercise, pyrexia, exposure to sun or to a warm room) or by excitement; the rather distinctive lesions consist of pruritic areas 1-2 mm in diameter surrounded by bright red macules. For delayed pressure urticaria do pressure test, for heat urticaria, perform heat provocation and threshold test.